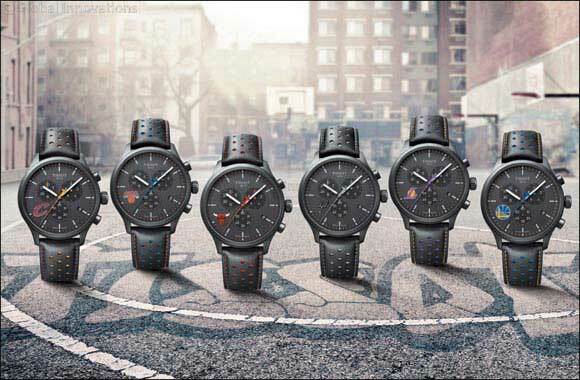 The Tissot Chrono XL NBA Team collection, like the players, makes a bold fashion statement, thanks to the large 45mm cases of the watches. This obviously makes for a flawless readability. The collection dedicated to the six NBA teams is full of appealing design quirks, including clear indices and a black dial, which leave the logo and team colours free to be admired. A useful chronograph function adds to the sporty appeal. No detail is left neglected with the Tissot Chrono XL. Slick black PVD coating on the case, coloured stitching on the leather strap and sandblasted finishing, which gives a matte finish, ensures the result is ultra-modern. No sports fan will be able to resist this stylish homage to their favourite team.